The truth is that this is one review that I never expected to write. After all, in the fifteen years of my being a published reviewer I have never had the reason to write this review. Yet surely its existence and that 2014 marks the fortieth anniversary of its publication—the very reason why the Reviews from R’lyeh anniversary series is being written—means that it should be written. The other reason I never expected to write this review was I did not own a copy of the game in question, but that became a possibility in 2013 with the publication by Wizards of the Coast of the Original Dungeons & Dragons Premium Reprint. So this then is a review of both—not just the aforementioned Original Dungeons & Dragons Premium Reprint, but also Original Dungeons & Dragons. In publishing the Original Dungeons & Dragons Premium Reprint, Wizards of the Coast has taken the contents of the 1974 Dungeons & Dragons White Box—‘ Volume 1: Men & Magic’, ‘Volume 2: Monsters & Treasure’, and ‘Volume 3: Underworld & Wilderness Adventures’ and added to it the supplements that came after it—‘Supplement I: Greyhawk’, ‘Supplement II: Blackmoor’, ‘Supplement III: Eldritch Wizardry’, and ‘Supplement IV: Gods, Demi-Gods & Heroes’, plus a complete set of very lovely polyhedral dice. All placed in a deep wooden presentation box etched with the famous fire-breathing dragon ampersand. The individual books themselves are beautifully presented, with just a little tidying up internally, and the use of the marbled texture for their covers, exactly as the original books in 1974. As a complete package, the Original Dungeons & Dragons Premium Reprint is beautifully presented, but make no mistake, this is a piece of gaming history, a piece of gaming ephemera. There can be no doubt that the contents of this lovely wooden box can be played—after all, the original roleplayers did so for many years with the copies of the Original Dungeons & Dragons they bought in the 1970s—but why would you? 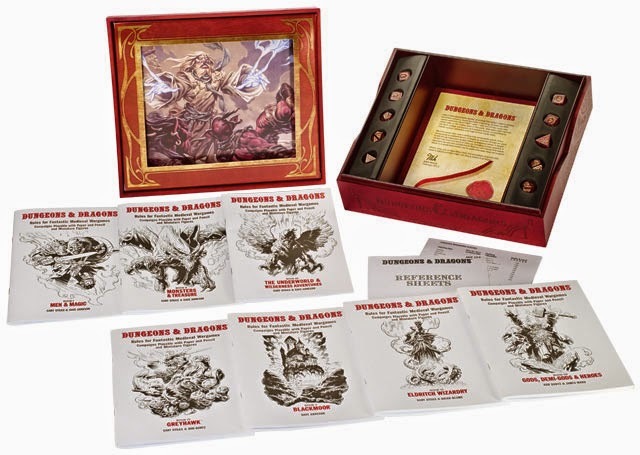 Putting aside the fact that there are better versions of Dungeons & Dragons and the like available to play, the Original Dungeons & Dragons Premium Reprint is a collector’s item—and very nice it is too. In reviewing the Original Dungeons & Dragons, we are concerned only with the three books that appeared in the White Box, for only they appeared in 1974. Thus this review is limited to—‘Volume 1: Men & Magic’, ‘Volume 2: Monsters & Treasure’, and ‘Volume 3: Underworld & Wilderness Adventures’. The starting point of course, is Chainmail, the miniatures campaign rules published by TSR out of which grew Dungeons & Dragons. Its influence upon Dungeons & Dragons is profound and cannot be underestimated—indeed this influence would arguably hinder the development of the game for over a quarter of a century, until the advent of Dungeons & Dragons Third Edition in 2000. Despite owning a copy of Original Dungeons & Dragons, it was not complete as Chainmail was required to handle combat, though an alternative combat system better allowed for man-to-man or man-to-monster fights, using a set of tables that will look familiar to anyone who played Basic Dungeons & Dragons or Advanced Dungeons & Dragons. What this means is that Original Dungeons & Dragons lived up its subtitle, ‘Rules for Fantastic Medieval Wargames Campaigns Playable with Paper and Pencil and Miniature Figures’. Characters options are limited to three Classes—Fighting-Man, Magic-User, and Cleric—and four races—Human, Dwarf, Elf, and Halflings (note, the 1974 version of Original Dungeons & Dragons had the Hobbit instead of Halfling, but that was before the Tolkien estate got litigious). The possibility of playing other character types is suggested, but left for the referee to develop. Much like the later Advanced Dungeons & Dragons and Basic Dungeons & Dragons, Halflings and Dwarfs are essentially Fighting-Men (Fighters) with Level caps on how far they can progress, whereas the Elf was allowed to switch between the Fighting-Man and the Magic-User whilst still under the limits of a Level cap. Other differences include there just being the three simple Alignments—Law, Neutral, and Chaos; and attributes primarily providing an Experience Point bonus depending upon a character’s class—Strength for Fighting-Men, Wisdom for Clerics, and so on, though Constitution provides a Hit Point bonus and Dexterity a missile fire to hit bonus. Nevertheless, a character still looks very similar to those that would come in later versions of the game—the same six attributes—Strength, Intelligence, Wisdom, Constitution, Dexterity, and Charisma; and Armour Class runs from ‘none’ (AC 9) down to ‘plate & shield’ (AC 2). Another oddity is the under use of Alignment. It is only important for the Cleric Class, limiting the type of structure that the Cleric can build when he gets to high enough level and access to some spells. At this nascent stage of the hobby, Clerics do not worship a specific deity—such information would not be available until the release of ‘Supplement IV: Gods, Demi-Gods & Heroes’ and then later, Deities & Demi-Gods for Advanced Dungeons & Dragons. Of course, the one way in which Alignment affected every character, regardless of their Class, was what magic items they could use. The inclusion of Alignment seems superfluous here, but much like the rest of Original Dungeons & Dragons, it lays the foundation for one of the elements that have underpinned Dungeons & Dragons ever since. The spells listed in ‘Volume 1: Men & Magic’ are all generic in nature. So what is included is Charm Person, Wizard Lock, Locate Object, Turn Sticks to Snakes, and so on, but not named spells like Bigby's Grasping Hand or Leomund's Tiny Hut. These of course would make an appearance in later versions of Dungeons & Dragons. Still, the spells are limited in Original Dungeons & Dragons so that Magic-User needs to be able to cast Third Level spells before he can cast any that do physical damage and the Cleric’s spells are very much focused on healing and support. Perhaps the strangest thing in ‘Volume 1: Men & Magic’ is its given ‘Scope’. It is suggested that a campaign can handle between four and fifty players, but that the recommended referee to player ratio is one to twenty! Now I have played in a campaign—D1-2 Descent Into the Depths of the Earth, D3 Vault of the Drow, and Q1 Queen of the Demonweb Pits—with eleven or twelve players, but not twenty! By modern standards, no Dungeon Master could be expected to give attention to fifty players, let alone twenty and give them the time to tell their stories. Nicely though, the Foreword to ‘Volume 1: Men & Magic’ prefigures the famous ‘Appendix N’ in the Dungeon Master’s Guide for Advanced Dungeons & Dragons. It suggests Edgar Rice Burroughs’ Martian stories, Robert E. Howard’s Conan tales, Fritz Leiber’s Fafhrd and the Gray Mouser adventures as inspiration. These suggestions point to a more pulpy inspiration, but what is curious is an absence from the list—J.R.R. Tolkien. So no The Hobbit and no The Lord of the Rings. Their later inclusion as inspiration would arguably make Dungeons & Dragons a much drier game, but their influence is very, very much in evidence here in terms of the Classes and Races available to play, and then equally, if not more so, in later editions of Dungeons & Dragons. Physically, ‘Volume 1: Men & Magic’ is ill-organised. Concepts such as Levels are detailed after equipment and encumbrance has been discussed, so by modern standards, there is no progression of subjects in a step-by-step process. Fortunately, this book is short enough to make flipping back and forth anything other than a challenge. ‘Volume 2: Monsters & Treasure’ lists some sixty or so entries in terms of foes, from Kobold and Goblins to signature creatures such as Green Slime and Purple Worm. Their main stats are listed in one large table with descriptions given later. These rarely amount to more than a paragraph or two, and only Dragons receiving as much comparative attention as they would in later editions of the game. This varying degree of attention feels unwieldy and unfair, so that Goblins and Kobolds are just there to butcher, but Dragons can be treated with, even subdued, which to be honest, feels very Tolkienesque. Sadly what is missing from this reprint is the citing of sources that appeared in the original version of Original Dungeons & Dragons. So no listing Tolkien as the source for Orcs, Wights, Spectres, or Rocs, and so on. This is for copyright reasons of course, but it is disappointing. The list of magical items and treasures reads like a ‘what’s what’ to come in future editions. Where ‘Volume 1: Men & Magic’ gives you what you played, ‘Volume 2: Monsters & Treasure’ gives you things to fight and things to find, ‘Volume 3: Underworld & Wilderness Adventures’ tells you how to play. It starts out with what might well be the first example of a dungeon before the publication of ‘Temple of the Frog’ in ‘Supplement II: Blackmoor’, and to be blunt, it is a terrible example. The problem is that its focus is upon mapping tricks designed to confuse and exasperate the player characters as they explore it, rather than on monsters and other threats, which feel lumped together. There is advice on stocking these underworlds with monsters and with a different treasure system, but more interesting is what is the very first example of play. It again betrays the origins of Original Dungeons & Dragons as a wargame, for its focus is entirely upon the Referee and Caller—the latter a role that would persist well into Advanced Dungeons & Dragons—with no room for roleplaying or the input for the other players. The result is a rather drab experience, with not even the prospect of combat to enliven things up or give a sense of threat. It is just a little too mechanical. Where Original Dungeons & Dragons suggested Chainmail as the means to handle combat, for wilderness travel it also suggests something else. This is Outdoor Survival, the 1972 Avalon Hill game. Here also is the first mention of both classic locations for Dungeons & Dragons, Greyhawk and Blackmoor, hinting at their contents, but not detailing them. They feel oddly rife with possibilities, but are here left undeveloped with only the map of the Outdoor Survival game for the Referee to go on. There is little advice as to how to create maps beyond the use of the game, and it feels oddly underdeveloped. Beyond this, ‘Volume 3: Underworld & Wilderness Adventures’ covers naval and aerial combat, hiring specialists, and so on. One notable rule is the ‘Angry Villager Rule’, one that suggests that should the player characters get out of line then the Referee should set the angry villagers/city watchmen/thieves’ guild members upon them. Not only will this happen, then the player characters cannot resist it. How I bet that some Dungeon Masters wish that this rule was still in effect! Rounding out ‘Volume 3: Underworld & Wilderness Adventures’ is a short section on healing. Vitally important in play, but lost at the very end of the rules. More importantly overall, the Afterword states that much has been glossed over, that Original Dungeons & Dragons contains only the essentials and that where any further trimmings are needed, then they will have to be added by the Referee and his players. There are of course undoubted omissions from Original Dungeons & Dragons—too many to list—evidence of that obviously showing in subsequent editions of Dungeons & Dragons. Physically, these three booklets are pleasingly presented. The organisation is terrible and the pen and ink illustrations are, to be frank, terrible. Ultimately, this is not a review that can really be written without the hindsight of forty years of roleplaying development and the race for the development of Dungeons & Dragons to catch up. Understandably, there is a rawness to Original Dungeons & Dragons. It is after all, the blueprint from which all other RPGs would spring. This means that it is not perfect and there are elements, bad habits even, that it would take a quarter of a century for Dungeons & Dragons to overcome as a roleplaying game. Arguably, this is not even the first roleplaying game, since the term would not appear at the time of its publication, but would be coined a year later in a review in White Dwarf. It is still too much of a wargame and an unforgiving one at that. A fascinating piece of history that was perhaps a step towards the first real roleplaying game, but however innovative it was in 1974, it was not quite there yet. As radical as Original Dungeons & Dragons was in 1974, perhaps it is too raw a game to be playable by modern standards.